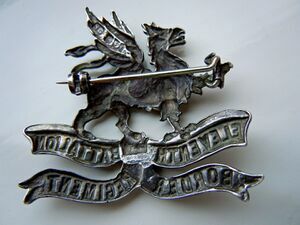 The 11th (Service) Battalion Border Regiment (Lonsdale), also known as the 11th Border Regiment or simply the Lonsdale Battalion, was a service battalion formed of three detachments at Carlisle, Kendal and Workington by the Earl of Lonsdale and an Executive Committee. There were a total of four companies in the three detachments: A and B Companies from East and North Cumberland were based at Blackhall Racecourse (Headquarters), C Company from Westmorland was based at Kendal, and D Company from West Cumberland was based at Workington. Lord Lonsdale asked 52 year old retired colonial officer Percy Wilfred Machell, C.M.G. if he would consider returning to a position of command after having spent over two decades of his military career in Egypt. 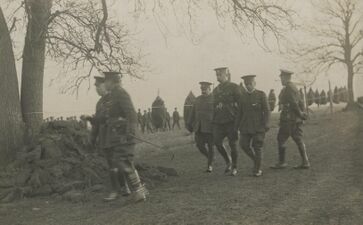 The Battalion soon became a well-trained, disciplined unit of volunteers that answered Field Marshal Earl Kitchener's call to arms - to fight for King and Country. Men that had grown up together enlisted together and "during these formative days of the Battalion’s earliest history it became clear to everyone in the Border Counties that this really was a Battalion of 'Pals,' of comrades, and of Border men." 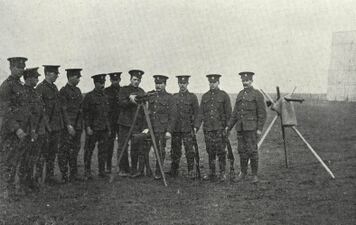 The camp at Blackhall remained central to the overall training of the men through the duration of the war. The first batch of Lonsdales moved to Prees Health Camp in May 1915 and there was attached to the 97th Brigade with the Glasgow men of the 15th, 16th and 17th Battalions of the Highland Light Infantry. In June the Lonsdales moved to Wensleydale and shortly after to Salisbury Plain where they remained for a few months. The Battalion landed at Boulogne on 23 November 1915 and spent the next two years and eight months in the trenches, fields and battle-torn villages of France and Flanders. On 10 May 1918 the Battalion was reduced to cadre strength, with surplus personnel transferred to the Territorial Battalion – 1/5th Border Regiment. Three days later it was transferred to the 66th (2nd East Lancashire) Division and on 31 July 1918 the Battalion was eventually disbanded. The Lonsdales actions were recorded for future generations to discover an interesting and diverse history. This is their story. The following is a transcription from the introductory text that accompanies The Lonsdale Battalion Border Regiment, September 1914 to June 1915. Through the Border Regiment the sister counties of Cumberland and Westmorland have been honourably associated with British military history for more than two hundred years. During the progress of the tremendous fight which is now being waged for the freedom of Europe and the security of modern civilization – both of which are at this moment threatened by a peril more deadly than any recorded in our history – this Regiment has already justified and enhanced a reputation of which the Border Counties may well be proud. Cumberland and Westmorland are fittingly represented in that most deadly of all the fighting lines the world has known; the line which gears our island home from the destroying hordes who have laid Belgium waste. It was not to be supposed that after the momentous events of August, 1914, when every other county in Britain was stirring its utmost to augment its share in the national defences, the Border Counties, with their stirring and virile traditions, would hold back. They are not densely populated counties, but it can never be said that in this world war Cumberland and Westmorland made no effort to secure for themselves distinctive representation, quite apart from the men they have sent to regiments in other sections of the country. 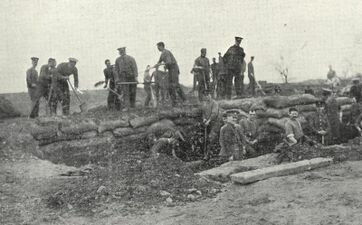 Soon after the outbreak of war it became evident to those directing the Cumberland and Westmorland Territorial Force that, whilst a good proportion of Border Counties men were anxious to play an able-bodied man’s part in the struggle, many hesitated to offer themselves for general service without knowing where or with whom they might have to train and serve. The Earl of Lonsdale, quick to see and understand this, submitted to the War Office a proposal to recruit a special local Battalion of Cumberland and Westmorland men. The approval of the Army Council was given (War Office letter No. 20/Gen. 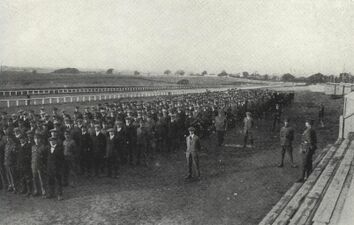 No./3162 (A.G.1), dated 17th September, 1914), an Executive Committee was formed, and it decided to raise the “Lonsdale” Battalion, in three detachments, viz., at Blackhall Racecourse, Carlisle, at Workington, and at Kendal. The Earl of Lonsdale was appointed Chairman, with Colonel Weston, M.P., as Vice-Chairman, Major Binning, Mr. F. R. Hodgson, and Captain Wakefield were appointed Goveners of Local Committees, at Carlisle, Workington, and Kendal, respectively, and Mr. Gerald Spring-Rice became Hon. Secretary of the Executive Committee. Lieut. Colonel P. W. Machell, C.M.G. 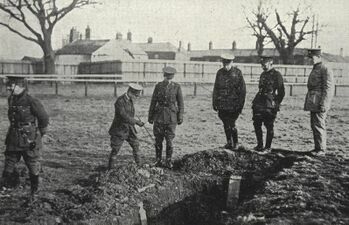 The camp at Blackhall, presently to become the Headquarters of the whole Battalion, was started on 25th September, 1914, by Major Binning and Captain Sale with 75 recruits, who formed the nucleus of “A” and “B” the North Cumberland Companies. At Workington, Messrs. Hodgson and Highton, assisted by Mr. J. McKay, together laid the foundations of “D”, the West Cumberland Company. 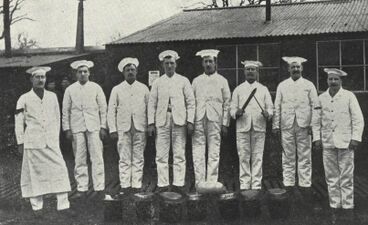 At Kendal Captain Wakefield undertook the enrollment of recruits for “C”, the Westmorland Company, which included two platoons, and one each from Windermere and North Westmorland. 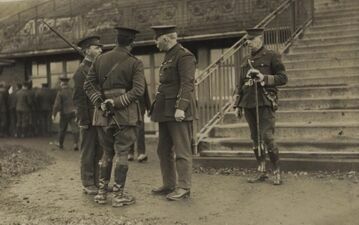 When Captain Wakefield left to join the colours, he was succeeded by Colonel Haworth, who raised and commanded “C” Company until it proceeded to Battalion Headquarters. 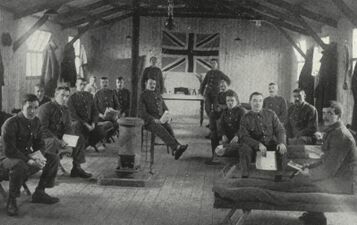 On October 15th the West Cumberland recruits were transferred from Workington to Blackhall Camp. 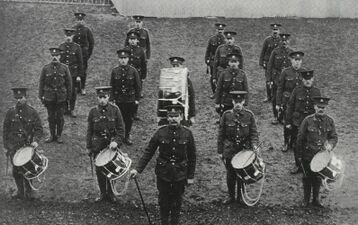 The Westmorland men remained at Kendal until January 5th, 1915, when (the hutments at Blackhall being completed) they were brought to Headquarters by Colonel Haworth, and handed over, 280 strong, as “C” Company. 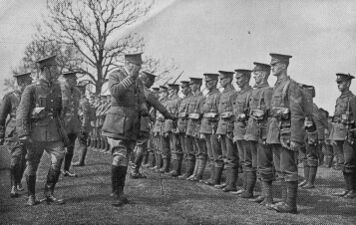 The command of the Lonsdale Battalion was given to Mr. P. W. Machell, C.M.G., of Crackenthorpe, with the temporary rank of Lieutenant-Colonel Machell in the Army from September 1st, 1914. 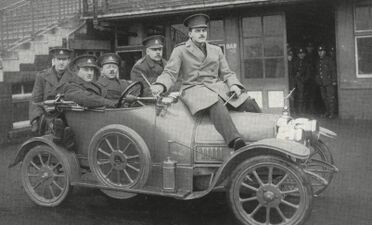 On October 17th, 1914, Lieutenant-Colonel Machell proceeded, with the Orderly Room Staff and Lieutenant and Quartermaster Dawson, from Penrith to Blackhall. 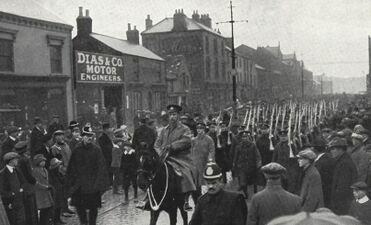 During October and November a great deal of hard spade work was done, and the foundations of the Battalion were well and truly laid in a spirit of practical patriotism, with every consideration for local feeling and good comradeship, and for the democratic ideals of the twentieth century worker. During these formative days of the Battalion’s earliest history it became clear to everyone in the Border Counties that this really was a Battalion of “Pals”, of comrades, and of Border men. From its Commanding Officer to the last joined recruit, all ranks worked together with a will, and in the friendliest spirit of unity, to make a Battalion which should eventually prove itself to be worthy of the best traditions of the British Army. There was here no suggestion of men working while the officers looked on. In the “Lonsdales” all realised that in this time of national emergency it behoved them to develop self-reliance to the utmost limit of their capacity. Lord Lonsdale’s unfailing generosity and watchful care were of the greatest possible value and assistance. 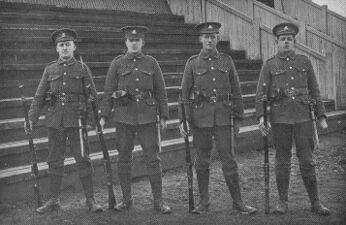 The growing Battalion made its own non-commissioned officers; the Border Counties furnished its officers; and recruits, at the rate of some fourteen or fifteen a day, began to say that they would join the Lonsdales or nothing. The Battalion, in short, became an accomplished fact, a reality of Border Counties life. Captain P. G. W. Diggle, Border Regiment, was appointed Adjutant from December 3rd, 1914; and R.Q.M.S. R. Stanley was Regimental Quartermaster-Sergeant from October 27th, 1914, until his appointment to a commission on 22nd February, 1915. A noteworthy personality in the Battalion’s period of early development was Colour-Sergt. Cowie (Border Regiment), who acted as Battalion Sergeant-Major from 1st October, 1914, to 20th May, 1915. 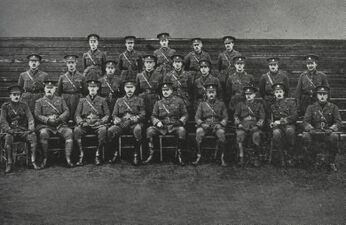 On January 3rd, 1915, the Battalion attained a total strength of 1,152 non-commissioned officers and men. By order of the War Office, conveyed in War Officer letter No.20/Infy./635 (A.G.1) dated 3rd December, 1914, the Lonsdale Battalion became the 11th (Service) Battalion, Border Regiment (Lonsdale). On the 10th December, 1914, the Battalion was attached to the 124th Infantry Brigade, commanded by Brigadier-General Collings. On the 16th March, 1915, the Battalion was transferred to the 112th Brigade, under Brigadier-General Mackenzie. On May 8th, 1915, the Battalion left Blackhall for Prees Heath Camp, Salop, where it joined the 97th Infantry Brigade, under Brigadier-General Hacket Thompson, C.B., the other Battalions being the 15th, 16th and 17th Highland Light Infantry (1st, 2nd and 3rd Glasgow). On June 22nd, 1915, the Battalion went under canvas at Wensley, in Yorkshire, where it was joined by the remainder of the Brigade. Writing a history of the Lonsdales has been done to a high standard before by several notable authors with a keen interest in the subject and a particular flair for telling a story. Authors with a keen eye for detail such as Stuart Eastwood and Douglas Sutherland, writing broader histories of the Border Regiment as a whole, take on board an informative prose that enlightens as well as educates. Even publications such as The Border Regiment in the Great War by Col. H.C. Wylly, CB, which at times can be a little dry, uses structured, factual information to it fullest. It is a combination of these styles that have been used to compile our history of the Lonsdales. It provides a factual base on which a story can be developed. That said, writing about the Lonsdales isn't just about informing the reader of their actions at a time of war it is also about having a passion for history and an interest in the subject to drive that passion forward. The author of this history is not a historian, nor a writer but has had a keen interest in the Battalion for over a decade. This history (not yet complete) will cover the period 1914 – 1918. The following pages continue the Lonsdales story. They are in chronological order. 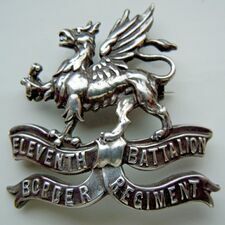 The 12th (Reserve) Battalion Border Regiment, also known as the 12th Border Regiment, was formed as reserve battalion from the Depot Companies of the Lonsdale Battalion at Prees Heath Camp on 26 May, 1915 and remained in the UK supplying drafts to the Lonsdales. On 1 September 1916 the Battalion was absorbed into the 75th Training Reserve Battalion of 17th Reserve Brigade. For casualties of the 12th (Reserve) Battalion, see below. 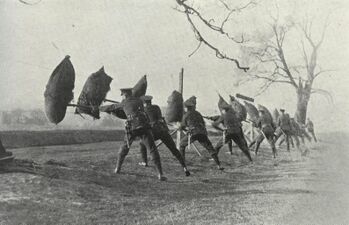 Border Regiment in the Great War, The by H.C. Wylly. 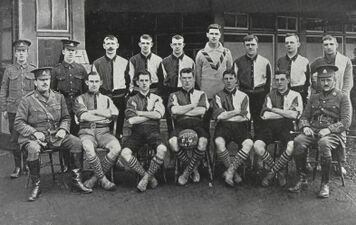 Lonsdale Battalion 1914 – 1918, The by Colin Bardgett. Redan Ridge - The Last Stand by Peter Weston. Thiepval - Battleground Somme by Michael Stedman. Tried and Valiant The Story of the Border Regiment 1702-1959 by Douglas Sutherland. Private John Farrer Hellfire Corner. Lonsdale Battalion Timeline Lowther Family and Estate. 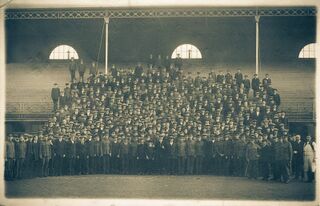 The 11th (Lonsdale) Battalion of the Border Regiment National Archives. Lonsdale Cemetery Commonwealth War Graves Commission. Border Regiment Battalions The Long Long Trail 1914-1918. Cumbria's Museum of Military Life The Regimental Museum at Carlisle. ↑ Named after Hugh Lowther, 5th Earl of Lonsdale, who raised the Battalion using his private funds. His request to name the Battalion after his own was officially granted by the War Office. ↑ The Lonsdale Battalion Border Regiment, September 1914 to June 1915. ↑ A small booklet comprising a selection of photographs from the Lonsdale battalion's early days of training at Blackhall Camp before setting off to war in France. The booklet was published in 1915 by Chas. Thurnham and Sons, 11 English Street, Carlisle. Digital copy provided by Kevin Johnstone. ↑ 4.0 4.1 12 The Border Regiment Orders of Battle. Accessed 7 August 2016. ↑ The Border Regiment Chris Barker. The Long, Long Trail. Accessed 7 August 2016. ↑ 2nd Lieut. J.B. Lowthian is pictured with his sisters, Nora and Gertrude, of the Red Cross. 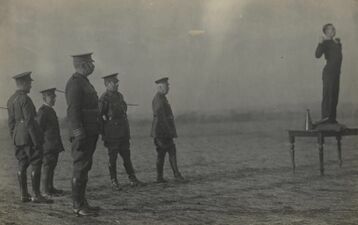 ↑ Lord Lonsdale in full service uniform inspecting the Battalion with (from left to right): Major P. G. W. Diggle, Capt. 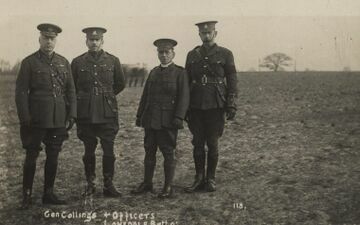 Smith, Brigadier General Collings and Lt-Col. Machell (to the right of Lord Lonsdale). This page was last edited on 22 March 2019, at 23:27.